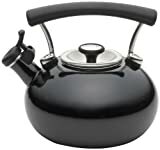 Want to see the best Circulon Contempo Tea Kettles available. 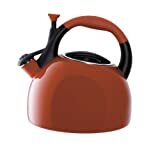 Check out our Best Circulon Contempo Tea Kettles list. Circulon has been at the forefront of function and style for over a quarter century, and the Circulon 2-quart morning bird teakettle is another ideal accessory for the contemporary kitchen. The kettle heats up to 8 cups of hot water for several portions of pour-over coffee or a large aromatic pot of steaming vanilla rooibos tea. 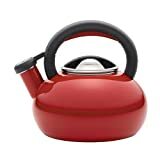 The teakettle's melodic whistle sounds when water comes to the boil, and the squeeze-and-pour handle with a textured rubber grip places the spout's lever at your fingertips for one-hand operation. The sleek profile of the teakettle adds a touch of fashion to function, as do all the great Circulon cookware and kitchenware products. Turn every cup of hot tea, coffee, and other beverages into an experience with the Circulon 2-quart morning bird teakettle. Circulon has brought more than 25 years of style and functionality to the home and for the day's first piping hot cup of coffee or tea, the Circulon 1.5-Quart Sunrise Teakettle delivers both and then some. 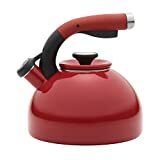 The distinctive shape of this teakettle looks fantastic on the stovetop or around the kitchen and it boils up to 6 cups of water for delicious hot cocoa with the family or a medium to large pot of English breakfast tea with friends. A whistle pleasantly signals when the water is at the boil and the handle's squeeze-and-pour spout is easy to operate. This teakettle's handsome blend of style and utility also complements other great Circulon cookware to add even more design to your kitchen. At any hour of the day or night, the Circulon 1.5-Quart Sunrise Teakettle serves up hot beverages with terrific design and performance. Stylish and functional, this 2.5 quart teakettle features a comfortable Santoprene® grip handle and a convenient push-button that opens the spring-loaded spout cover.